A concise history of Bulgaria for those visitors to the country who would like to learn more about its people and history. The book is a real mine of information, represented clearly, rich in illustrations and tables revealing the parallel events in the western world. The Rose of the Balkans is not an academic work. Its aim is to present to the public a contemporary version of Bulgarian history in the light of recent analyses and reflections of historians from the Balkans, Bulgaria and abroad. It notifies the travelers of the origins of the country and gives them knowledge of the most recent events, so that they will find sufficiently broad outlines. At the same time it prunes supernumerary details and final judgments. 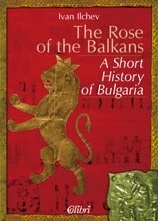 Foreign countries’ attitude to Bulgaria is usually based on the knowledge of our own history. We therefore sought to situate events of Bulgarian history in the context of the Francophone countries. The reader will observe strike reports, similarities or coincidences between the processes that took place simultaneously at both ends of Europe. To avoid the risk of bias, we referred to the evidence of French observers, who have got information about the original aspects of the country, the character and customs of its inhabitants. The book is published in French with the support of the French Ministry of Foreign Affairs, the Embassy of France in Bulgaria and the French Institute. The Bulgarians found themselves on the Balkans at times that were difficult for Byzantium. Inspired by Islam, Arabs had begun the persistent onslaught from the east that was to continue for three centuries and at times bring the empire to the brink of ruin. The state borders so dear to the heart of contemporary man were practically non-existent. The garrisons along the border were weak and could not stop invaders. There was a niche in power, which the Bulgarians were quick to fill. They began a series of pillaging attacks to the south. And what was more disconcerting from the point of view of Constantinople, the newcomers began to ally themselves with the Slavs on the time-honoured principle that the enemy of one’s enemy is one’s friend. Emperor Constantine IV Pogonates decided to follow the example of Alexander the Great and cut through the Gordian knot of increasingly complex problems with one blow. He loaded a large army on ships, sent another by land, and besieged the Bulgarians in their fortified camp. The adversary, however, was experienced in making fortifications. The siege dragged on. There were also numerous Bulgarian parties in the steppe, which attacked the Byzantines from the rear. The supposed military stroll became a costly undertaking. There was considerable danger of defeat. To be a ruler one should have a keen sense of which way the wind blows. And Constantine had sufficient experience as a ruler, so his unexpected bout of gout was not surprising. The emperor boarded his ships and, accompanied by his closest courtiers, allegedly headed for the mineral springs in Messembria. His soldiers, however, were no fools, either. They saw they were being left on the barren beach, with armed Bulgarians in front and other armed Bulgarians behind, so they followed suit and headed for the ships. Panic ran amok. The besieged saw their chance. They went outside the walls and a great slaughter began. The Byzantine army was defeated. Such, at least, was the version of the Byzantine chroniclers who, as most professionals do, tended to chalk up the victories of their armies to their skill, while their defeats were justified by the mere chance of the opponent. Encouraged, the Bulgarians poured into Eastern Thrace. The emperor, whose throne was rocking, was forced to conclude a peace with the invaders and to pay them due. He probably consoled himself with the thought that this was not the first barbarian tribe to have passed in oblivion, to which the eternal empire paid due shortly before it fell victim to the combined pressure of Byzantium’s might and the desire for its riches. This time, however, no such thing happened. Surprisingly, this new state whose Balkan birth we count in 681, has now been part of Europe for more than thirteen centuries. It is Byzantium and the numerous barbarian states, founded more or less at the same time as Bulgaria, that have long passed into oblivion. They came and went, while Bulgaria remained. At the beginning, however, even the most impassioned of gamblers would hardly have bet on the chances of the Bulgarians. Their fate hung by a thread through the first two centuries. Victories and defeats alternated relentlessly. The Byzantium interchanged strategies, opting for military power, diplomacy, and even seeking the aid of distant allies to deal with the nuisance. The Bulgarians had to fortify their defence to the south, and saw the solution in consolidating their relations with the Slavs. Mixed marriages became a frequent occurrence, and the Slav aristocracy began to participate in the administration of the state.